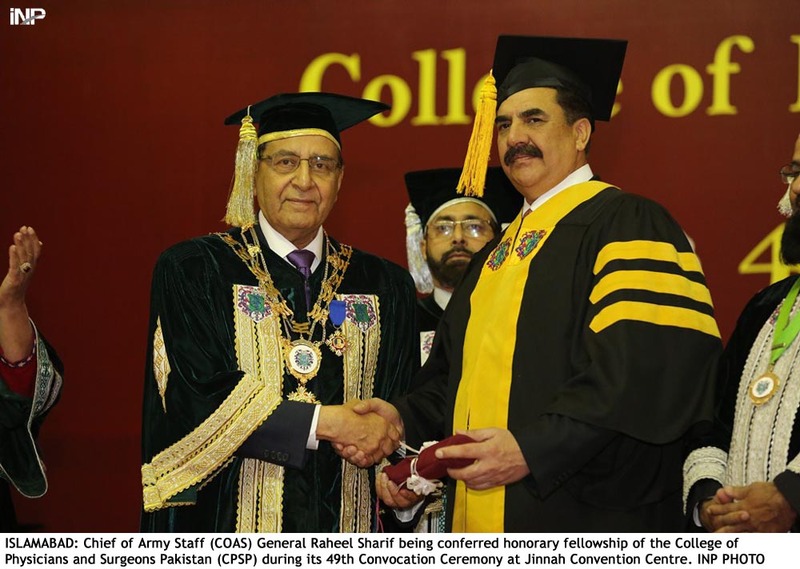 The 49th Convocation Ceremony of College of Physicians and Surgeons Pakistan (CPSP), was held on Monday at the Jinnah Convention Centre, Islamabad, with Chief of Army Staff (COAS) General Raheel Sharif as chief guest on the occasion. CPSP President Prof Zafarullah Chaudhry in his welcome address acknowledged COAS for his contributions and strenuous efforts for peace and stability in the country, his remarkable achievements against terrorism and for modernizing the health care system in Pakistan Army. Army Chief General Raheel Sharif said that today, by the grace of Allah Almighty, an environment had been created where fear and retribution from the terrorists and criminals had been significantly reduced. However, relative security needs to be transformed into an enduring peace and stability for the nation. A unified national approach is important to bring the armed forces’ endeavors to a logical end. COAS paid tribute to sacrifices of citizens and soldiers in achieving this stability and peace. While congratulating the graduating students, COAS said that to steer the country towards success, we need to invest in our future generations. To this end, every individual, especially the educated professionals, have an enormous responsibility. It is my belief that today’s Fellows will rise and shine as the future of Pakistan. General Raheel Sharif praised the college for improving postgraduate medical education and health care services in the country.